Bank deposit This feature allows you to pay with a bank deposit. When choosing this option, your customer will see the details of a wire transfer when completing the order. Cash on Delivery A payment method that allows customers to pay for the product upon delivery. You will receive the payment when the product will be delivered to the customer. Check This option allows your customers to pay you by a paper check that you can deposit at a later time. When choosing this option, your customer can issue you a prepaid check to pay for the order with. 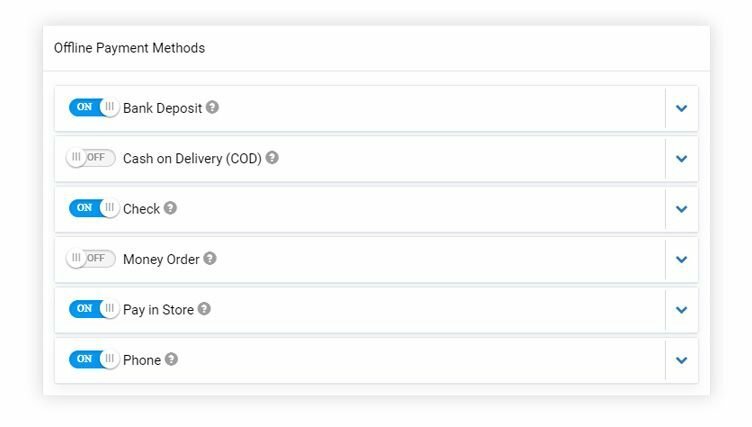 Money Order Your customers can use this feature to pay you by going to the post office or bank and purchase a prepaid check with the order amount. Pay in Store A payment method where your customer will come to your physical location to purchase the item. Phone Customers using this method will see your phone number when finishing with their checkout. This will allow them to call you to make the payment. 오늘 US에서 1885가 넘는 SITE123 웹사이트가 개설되었습니다!